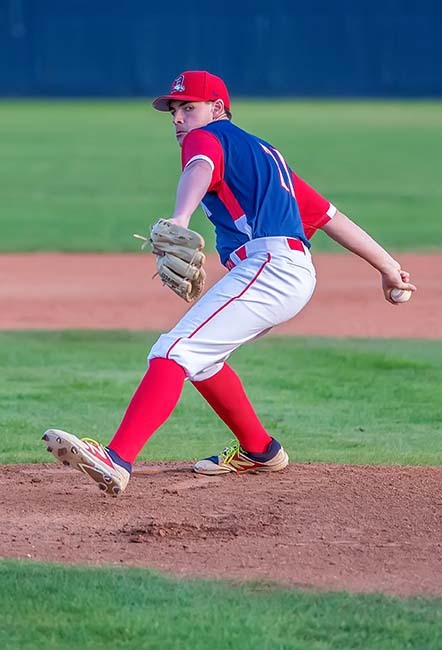 Dawson pitcher John Rawlinson pitched six innings and gave up three runs on eight hits with seven strikeouts and two walks. PEARLAND DAWSON — The Dawson Eagles hosted the George Ranch Longhorns in an important District 23-6A contest and came up short 3-2. The Longhorns entered the game tied atop the district leaderboard with Pearland at 3-0 and Dawson (1-2) was looking to even their district mark at 2-2. Dawson got things started in the bottom of the second when they scored a pair of runs for a 2-0 lead. Zackery Mack opened up the frame with a line drive single to left and moved to second on a George Ranch error. Jacob Carriere sacrificed Mack to third for the first out of the inning. Jacob Ramirez worked the George Ranch pitcher for a walk putting runners at first and third. Hayden Curry also walks to load the bases. Tristan Schwehr delivers a two-run double that scores two runs for the Eagles. George Ranch would score a run in the top of the third and fourth innings to tie up the game 2-2. The Longhorns would then get the game winning run in the top of the sixth when Dawson committed a throwing error that allowed the Longhorns to take a 3-2 lead. The Eagles threatened in the bottom half of the sixth, but were unable to push across the tying run. Dawson junior pitcher John Rawlinson pitched six innings and gave up three runs on eight hits with seven strikeouts and two walks. Dawson got only five hits with Mack leading the way going 2-for-3 with one run scored. The Eagles drop to 1-3 in district while George Ranch improves to 4-0.